For example, take the Mariners’ past two months. On July 1, they were a half-game out of first place in the American League West and eight games up in the wild card derby. The fall from grace has been breathtaking. Seattle had to win Thursday or fall 6½ games behind Oakland in the race for the last wild card spot. As it is, the result brought them merely to within 4½ games. Taking two of the three remaining in the series provides a little air. Lose two and the 5½-game deficit requires supplemental oxygen. Things looked bleak as ever in the first inning Thursday. With men on the corners, Nelson Cruz hit a smash that A’s pitcher Frankie Montas speared and turned into the second out, trapping Mitch Haniger between third and home. It was a rocket, sure, but with no net gain. Then Montas walked Kyle Seager and Ryon Healy singled home a run. The inning should have ended there, but two muffed plays – one ruled an error, one not – by third-base defensive whiz Matt Chapman let in three more runs. But by inning’s end, the Mariners had five runs, one more than they had in 18 innings of the previous two games against the dreadful Padres. How big? 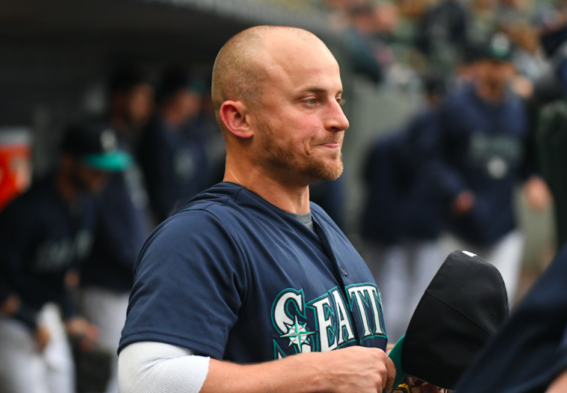 The non-waiver trade deadline hits at 9 p.m. PT Friday, and the Mariners are now just close enough to the post-season that they likely can’t think of shedding anybody. Instead, they could look for a hitter – Josh Donaldson, Curtis Granderson and (dare we say his name?) Justin Smoak come to mind. Any of those could give the Mariners some badly needed sock. No offensive boost will come from the minor leagues. The roster expands Saturday to 40 players, but other than bringing up a third catcher, David Freitas, the call-ups will be pitchers, at least to start. The minor league cupboard is devoid of MLB-caliber offense. There was a time when it didn’t seem as if additional sock was needed. When July began, the Mariners were hitting .261 – their non-April high-water mark – with a .322 on-base percentage while averaging 1.20 homers per game. On July 1, they reachecd 23 over .500. But that win was by a 1-0 score. The meagerness proved to be a portent of the next two months. After averaging 4.42 runs per game through June, the Mariners averaged just 3.66 since, going 22-28. Direct correlation? Yeah, just a bit. Asked about it before Thursday’s game, manager Scott Servais smiled wryly and came out with the pronouncement of the month. “We’re not getting any hits,” he said. Oh, OK. That explains the .247 average since July 1, an on-base percentage that has tanked to .299 and less than one homer per game. It is a problem that Servais and batting coach Edgar Martinez have tried to tackle, without any apparent success, Thursday’s seven runs notwithstanding. Most specifically it hasn’t happened for 3B Kyle Seager. He came into the season a career .263 hitter. His average this year has been over .263 exactly four days, most recently April 17. He went hitless Thursday and sits at .218. He says he’s tried maybe 40 different batting stances, but none of them remind the Mariners of the one-time All-Star and middle-of-the-lineup bat that he once was. If there is one player who’s been beaten by defensive shifts, it’s Seager, a lefty whose ability to pull the ball has been neutralized. In 2015, he saw defenses shift against him 36 percent of the time. This year, it’s double that. The tactic is working. Then there’s Robinson Cano. He was hitting .287 with four homers and 23 RBI mid-May when he was hit by a pitch that broke his right hand. Two days later came an 80-game suspension for violation of MLB’s drug rules. He’s been back for a couple of weeks now, but his bat is still mostly on the disabled list – a .274 average after two hits Thursday, but with one homer and six RBI. “I understand how this game goes,” Martinez said. “Early in the year, everything went well. Then it got to the point where we weren’t scoring runs and then the players tried to do more. And when you try to do more, usually it doesn’t work. The Mariners have caught something of a break with the A’s unable to keep their starting pitchers healthy. Montas was starting because ace Sean Manaea just went on the DL and may not pitch again this season. A’s starting pitchers have combined to go on the DL 11 times this season. No one who began the season in the rotation is there now. So the door is open a crack this weekend. “I will say that we’ve still got (28) games left to play,” Servais said. “Some of the guys, the numbers are what they are. The way to look at it for our games is to say, ‘What can I go out tonight and do to help our team win?’ That’s the focus they need to have, and that’s the mindset they do have. For one night, they did. Will Ichiro get added to the rooster? These are desperate times. I like the idea of adding him to a rooster. Where did you come up with that? Well Nintendo still has I believe a 10% share of the team? So yeah anything is possible. Correct me if I’m wrong. No global warming at this location. It’s 42 below. That’s the run differential for the season and it’s September, boys. Bill James, baseball’s Pythagorean stat master, used to say that playoff teams need a ‘plus 100’ on run differential. It varied. Sometimes they didn’t but typically they had to have it. The M’s are twelfth out of fifteen teams in runs scored, I believe. Launch and burn the ‘launch point’. Your in a pitcher’s park. The OBP on the back end of the lineup is a Billy Ball nightmare. Get on base. That would help. Run differential is indeed a reasonable, not an absolute, predictor. To win with a minus total requires a more stout rotation than what we see here. The M’s need a Festivus (in September) miracle. The many one run and extra inning wins in the first half threw shade on the dearth of starting pitching. Marco and Mike lost their mojo, Felix lost his career and a few of the bullpen spots turned into dust. Seagar’s down season has really hurt, as has his and Z’s propensity for striking out. At some point, they are what they are. I am still holding out optimism for these final 30 days. They haven’t had a miracle in 17 years, so yeah. The Seager shift is downright ridiculous. Kyle’s offseason should be devoted to learning how to use the entire field. An intense course taught by Edgar and Ichiro should be required.